Japan has a strong concept of family and loyalty, which can certainly be an inspiration for all cultures across the world and in contemporary times. 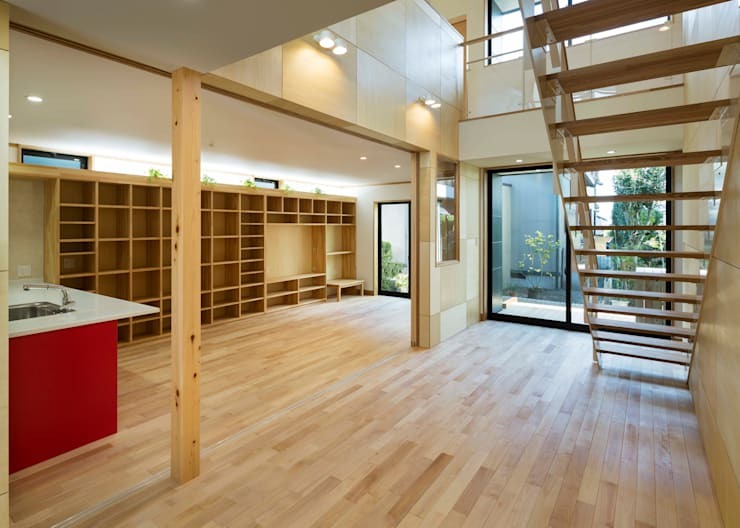 Traditional Japanese homes have then also reflected this in their design and ample allowance for family and communal space. Today on homify we will look at a contemporary home which adheres to this ethic, whilst also incorporating modern aesthetics and design. The Okazki Rhinoceros Auklets house had been designed by the architect, Tabata Sekkei. 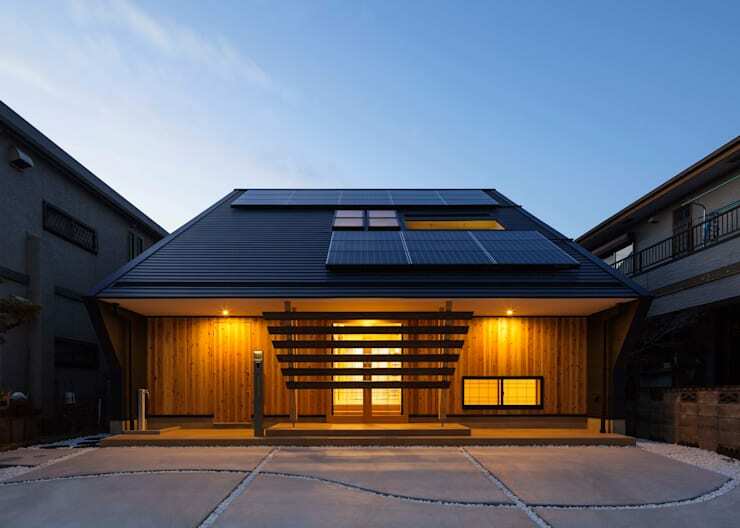 As you’ll see when we take a closer look at the house, it is a modern home constructed of wood, and designed to be energy efficient and eco-friendly, especially by its use of the renewable energy source of solar energy. Hear we can see the Okazki House in all its glory. It is beautifully and warmly lighted in the encroaching twilight. Before we even get to the house, we can see a lovely courtyard in a Zen style, with stone slabs divided by fluent lines of white pebbles. This creates the ideal outdoor atmosphere for either peaceful meditation or family recreation activities. The house is built on a lot of a mere 206.76 square metres, but the architects managed to fit a household floor area of 149.88 square metres in it without looking cramped and leaving plenty of space for outdoor living and recreation. As we can see, the home makes full use of available space, and although aesthetically pleasing, it is first of all entirely practical. 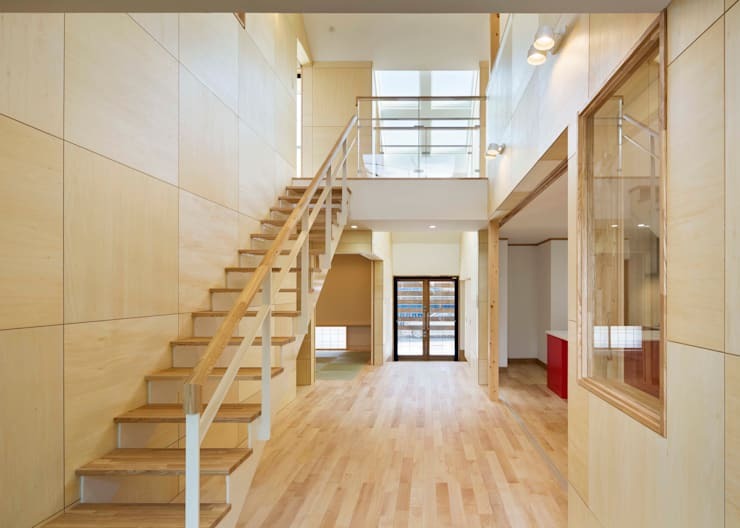 The Okazki House is a clear integration of the modern and the traditional. This is not only evident in the cultural ethic underlying the home’s design, but also in the materials used in its construction. Here we can best see the combination of wooden elements in the house’s façade (which is repeated in the home’s interior) have been used in traditional housing since time immemorial. It is recognised the world over that wood has many structural qualities ideal for home construction, when treated properly, of course. Above all, nothing comes close to the beauty of wooden homes and the visual warmth associated with it. The sides of the home is constructed of concrete slabs – characteristic of modern architecture, especially in industrial designs. This gives the home a contemporary edge which complements the traditional beauty of the wooden inserts. The contrast in colour also allows for plenty of visual interest in the composition. What is immediately apparent in the house’s design is a well-planned structure, influenced by beauty and balance. 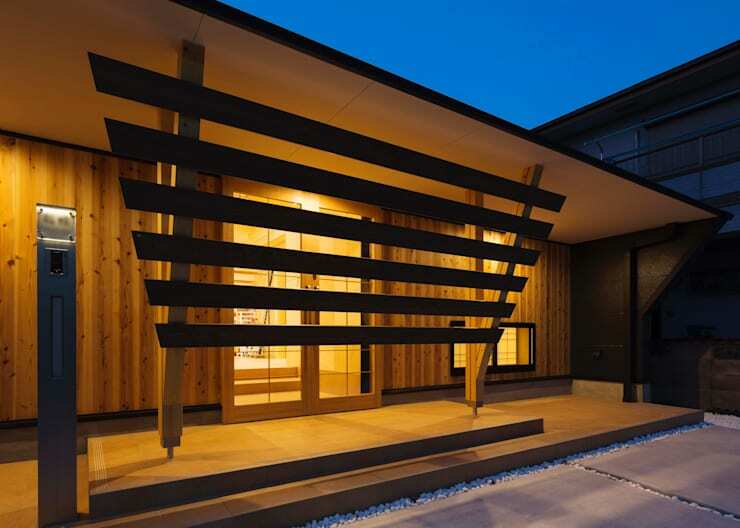 On the veranda of the home we can see a double-tiered porch leading up from the Zen courtyard, which leads the eyes (and feet) to a central supporting structure on the veranda. This consists of two wooden beams supporting the roof, supplemented by lateral wood planks evenly spaced and growing in length. The visual rhythm this brings about is aesthetically pleasing to the eye, and the symmetry of the entire composition supports the sense of balance and serenity present in the larger property. Moving inside the home, we firstly find a sense of openness and transparency. The internal structure of the house leaves the spaces flowing into one another in an open-plan design that takes the concept to another level. The light colour of the timber used in the flooring, walls and stairs, combined with the remaining surfaces painted white, expands the space even more and allows natural light to reflect an illuminate every corner. There are many windows as well, right in line with any guest’s vision when they enter the house. This gives the home a transparent character and relates well to the concept of the family home. The abundant light these windows allow to enter the home from the outside also adds to this idea of transparency and illumination, as well as create a fresh and bright atmosphere. When we enter the house and move off to the right of the foyer, we find the first part of the communal area of the home, here sectioned off with sliding glass doors bordered by wooden trim. 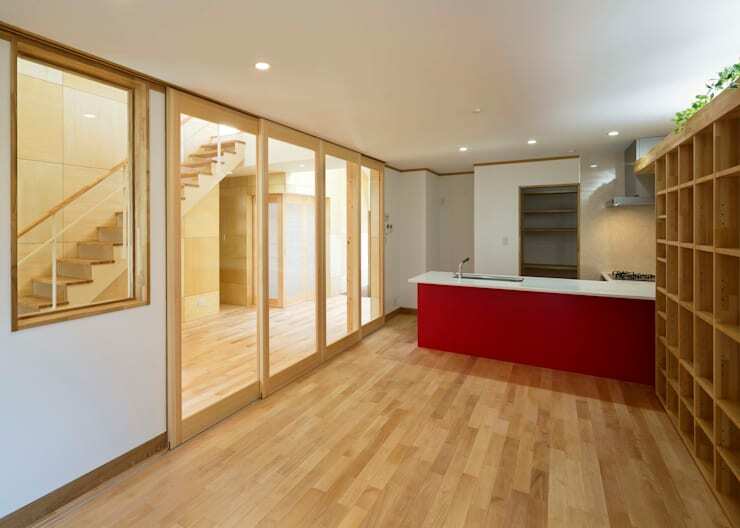 This clearly houses a kitchen area – light and spacious with only the bright red kitchen bench to centre attention. The rest of the room is clear and spacious, with a multitude of shelf space to the right. This area is the focal point, the heart, of the home, and was planned around the concept of the “family meeting”. This is a multi-purpose hall which can be adjusted to each occasion and furnished or decorated to the family’s particular tastes and needs. The area also has floor heating to make it comfortable to spend time in whatever the season. In the summer, the plentiful windows and doors can be opened to allow a breeze inside and integrate the space with the outdoors. 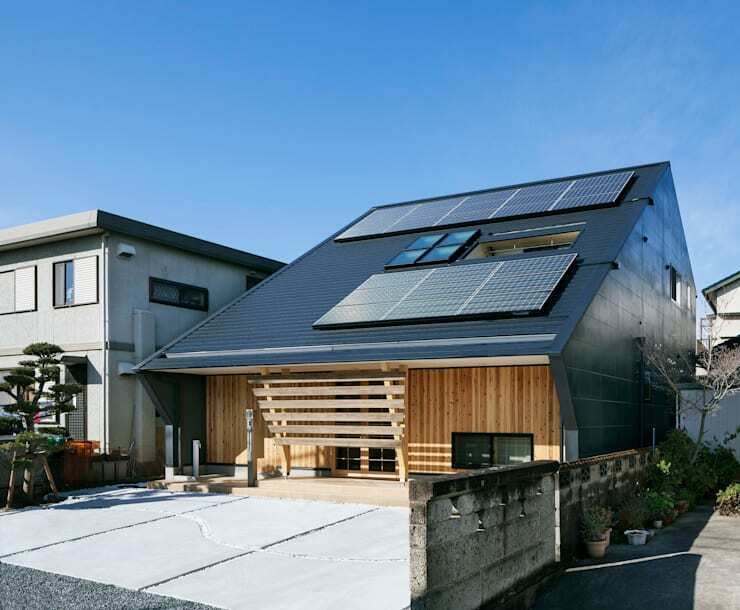 If you were interested in this Japanese family home, you might also enjoy a house built to make family memories in: The Breathtaking One Roof House. Do you think this is a good family home? What do you like about it? Let us know in the comments!